This mix package consists of 10 balls (2x5 colors) We Love Yarn-cotton in a nice 8/4 quality. The yarn pack contains beautiful subtle colors, and in can be yours for a genuine give-away price. We Love Yarn-yarn is a simple everyday-cotton. The yarn can be used for any given project you might have in mind, whether it’s sweaters, tops, cardigans, potholders, coasters or rags. The We love Yarn cotton is perfect for both knitting- and crocheting projects, similar to other 8/4 cotton yarns. 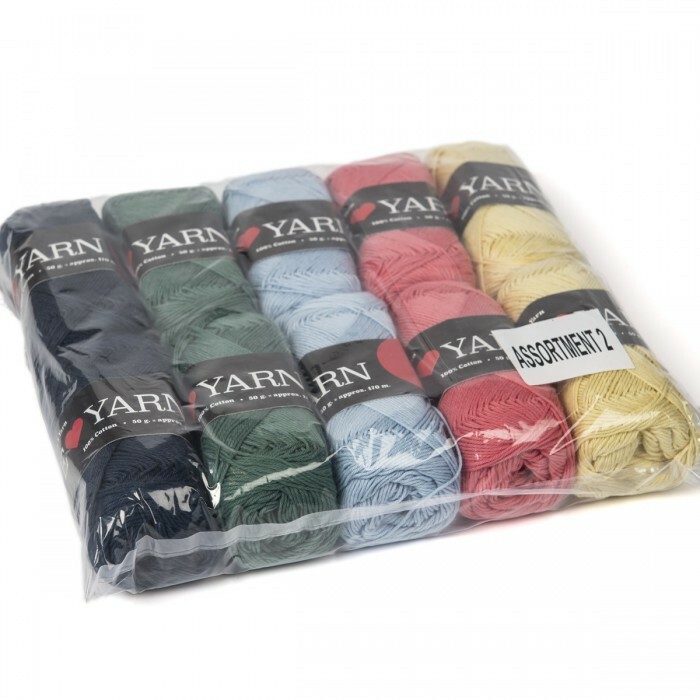 We Love Yarn comes in a range of wonderful, modern colors - you will definitely be able to find one that suits you. Bought this yarn as a trial, was a bit concerned as you are at yr 1st buy. But no worries, lovely cotton yarn, good colours, delivery much quicker than expected. And the price was very reasonable as well. All round 10/10.